I love traveling by train and I love traveling with a reserved seat. As I wasn’t in a real hurry to get anywhere, I took the opportunity of traveling the slow way on Amtrak’s Coast Starlight route from San Jose, California up north to Portland, Oregon. 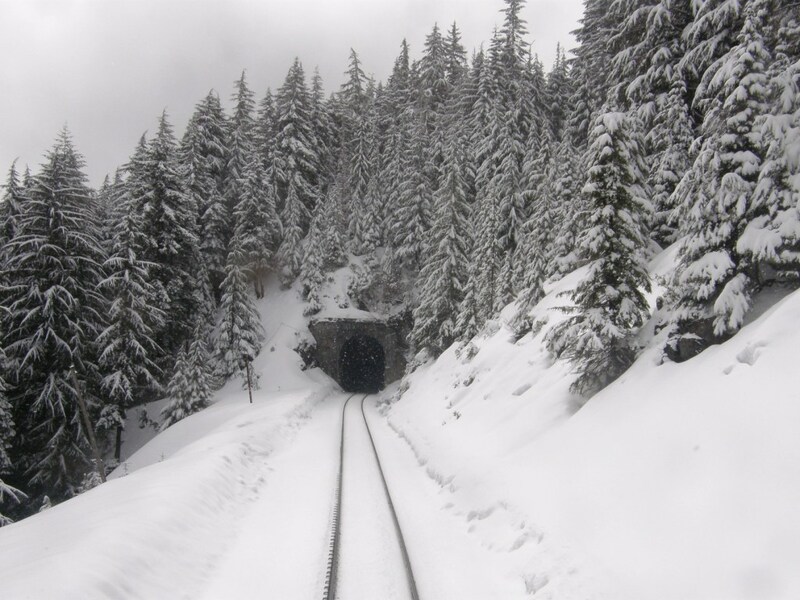 I was fortunate that the Portland and Seattle passengers were seated in the last car which meant that I could stand at the back door and watch the track roll away through these magical wintry scenes. The other passengers had very “been there, done that” attitudes but, for this gal who lives in tropical lowland Bolivia, it was an absolute treat! This meant that I could pretty much hog that back door view for the entire day. I was so tempted to press the door button to see if it would open especially when it started to snow and the glass got covered. Slowly we rocked our way across mountains, passing through numerous tunnels, emerging to views of deep valleys sweeping away to the right…gorgeous!! 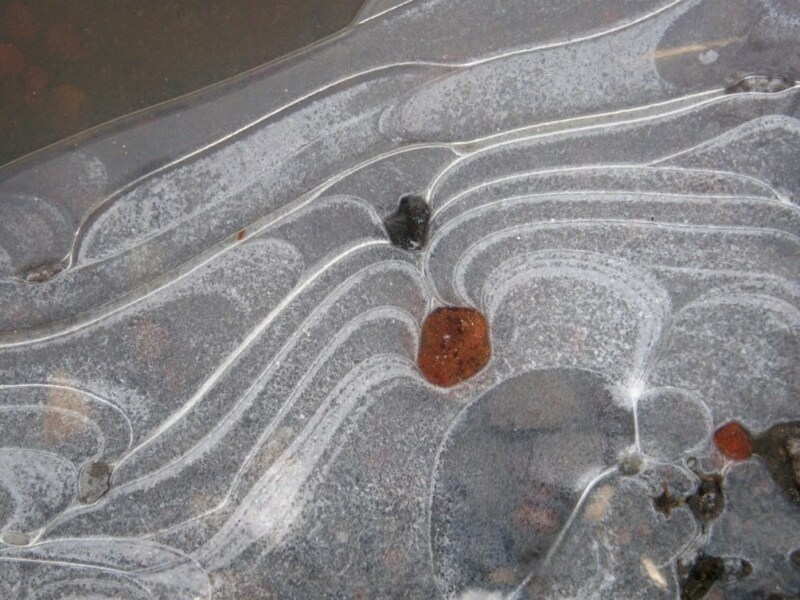 There were plenty of ‘fresh air” stops where we could get out and stretch and see “ice art” in the puddles. It’s probabaly all very “ho-hum” for north-west natives but it was all new and delightful to me. After Eugene, the snow was over and soon we started to pass through ever increasing suburbia until finally rolling into Portland where I was met by Betty who was having me as her guest for the next couple of weeks in her home just over the river in Washington state. 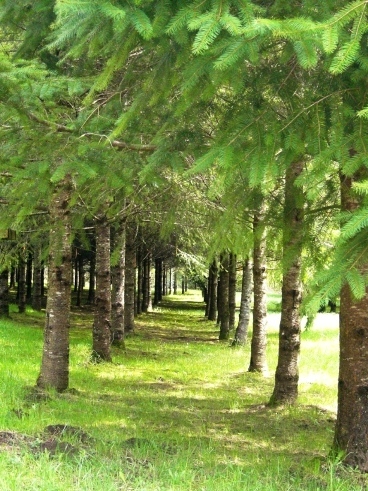 While I loved looking at the snow, I was glad to be out of it and into the cool, shady green with hints of spring of Betty’s tree farm. And this is where my faithful camera friend of the last three years decided to die :-(. “Internal sensor failure” was the problem I was told…too expensive to make a repair worthwhile. This problem was giving a pinkish hue to my pictures when the camera was in a good mood and weird color-streaked images when it was not. Luckily I have a wee Casio point-and-shoot as a back-up camera but I have to learn its particular quirks and get used to using it…darn! Those of you who follow my blog may remember that I stayed with Betty on my spring trip last year and showed pictures of many of the fabulous weavings that she has collected in her travels over the years. I would have to be here for months to be able to see and photograph them all. In fact, last time I looked at too many and was quite overwhelmed. You get to the point where you stop seeing the beauty of each individual piece and so it has been great to have this chance to go over the collection again. Actually there are enough beautiful things hanging on her walls to keep me occupied without even thinking about going through the pieces that have been carefully stored away. Here are just a few bits and pieces…. I love the simplicity of the striped incredibly fine cotton warp-faced piece on the left with the card-woven strap, which Betty bought in a Tibetan refugee center in India. It’s an apron that forms part of a Tibetan traditional costume with a card-woven waist band. It contrasts with the riot of color and intricate supplementary weft patterns on the Bhutanese bed cover on the right. 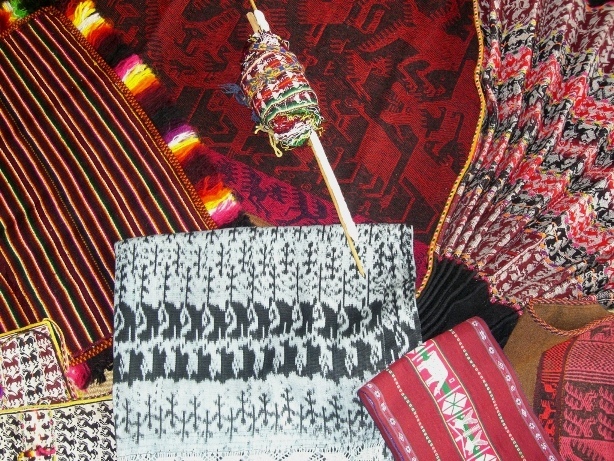 This is a small selection of textiles from Peru, Bolivia and Ecuador. 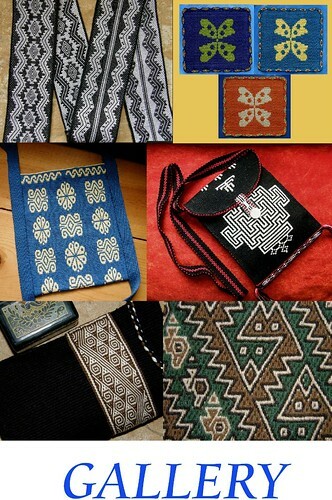 This group includes an ikat shawl from Ecuador, a double weave belt from Taquile Island, Peru and a small striped poncho from Tarabuco, Bolivia among other things. I just LOVE the piece from Bhutan above left which has supplementary wefts woven into a twill base…that technique is still on my to-do list along with the discontinuous-warp technique you can see in the piece from Pitumarca Peru on the right (the figure in the center is an adornment that was added by Betty). I have made a few experiments in discontinuous warp after seeing the fabulous work of the Pitumarca weavers at the Tinkuy in 2010…multi-paneled pieces covered in pick-up patterns but I find this simple plain-weave piece in Bettys’ collection particularly inspiring and this following one even more so…. Betty thinks that this piece may be one of those that were made when the Pitumarca weavers were first attempting to recover this ancient technique. It is warp dominant rather than warp faced…you can see the weft and see through the fabric when it is held up to the light. It is nothing like the sturdy heavily-beaten warp-faced cloth that is typically produced. It has been edged with a simple single-color plain-weave tubular band. The over-twisted handspun yarn is still causing the corners to curl. You can see above left what I am guessing would be called the discontinuous weft where the panels join vertically. 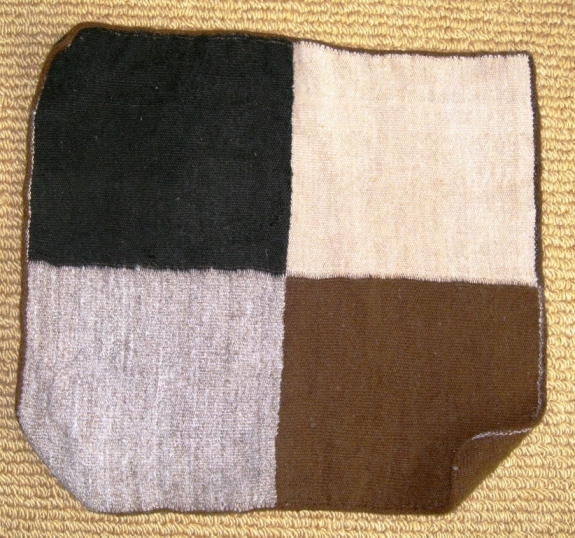 The brown weft which is being used in the panel below right turns around the grey weft on the left when the two wefts meet at the join. This means that the color of each panel can be solid. You can also see how the warps dovetail at the horizontal joins between panels. Betty is not sure how many years ago she bought this piece, but this is the progress that the Pitumarca weavers have made in this technique since then…. This piece has four panels of discontinuous warps with supplementary warp patterning in each. 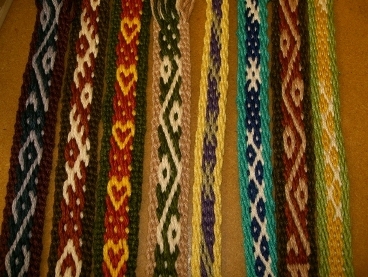 Belts and sashes from the Andes and Guatemala and a reverse-applique Mola from Panama. I loved this little hanging which is in the guest bathroom. It turns out that this is one of the first weavings that Betty ever made. Knowing the legendary status that Betty has achieved in the world of weaving, this was quite wonderful to see. 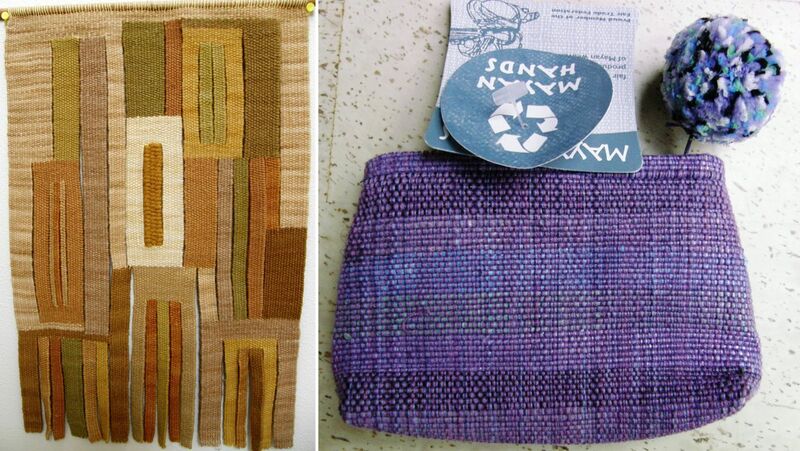 The other piece is a dear little purse that has been woven from recycled plastic bags in Guatemala. Between all the textile and fiber wanderings in Betty’s home and studio (I got to sleep in the studio again! ), I had some organizing to do…not an easy thing among so much distraction! I was emptying bags and bags of yarn and warps on the floor much to the amusement (or perhaps indignation) of Trouble the cat who stood guard in case one of the balls decided to wander off. Here are a couple of the ladies who came to weave…Sasha (who wants to learn backstrap weaving as it is part of her heritage…any guesses as to where her roots may lie?) and Emi who is interested in all aspects of primitive technologies. It was great to meet Jenny on the left and Linda who are both members of the Ravelry Backstrap Weaving Group. That’s Judy next to them. All three are working on their second weft patterned bands. Weaving away! 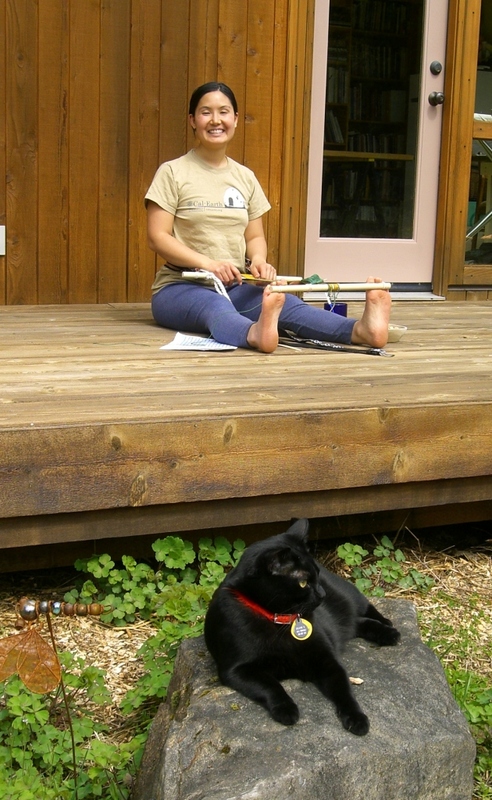 Jenny pauses to figure her next move in her simple warp float pattern. Rona is checking the cross on her four-stake warp before removing it from the stakes. It is funny how people often unconsciously choose yarns that match their outfit. On the way home from the weaving group, Mt Hood and Mt St Helens put on the most fabulous show for me. Both are heavily laden with snow and looked spectacular in the soft evening light. But there was no where to stop and photograph them! My back-up point-and-shoot camera does not have the zoom capacity to have done a worthy job in any case. I got to climb a rather different looking Mt Hood in the summer of 1992 as well as fly around Mt St Helens in a friend’s private plane but I much prefer the way these two beautiful peaks look in their winter coats. Most of the people in this weaving group also promised to come to another the following weekend. I had a busy and fun time in the five days between. On Tuesday and Wednesday I had a visit from some other Ravelry pals. These are two Backstrap Weaving Group members who have been around since the early days. Jennifer and Bobbie are strong and very active members, head cheerleaders, back-patters, welcoming committee and “commiserators” and I am so grateful for their continued support and participation. It really was a thrill to have them with me for those two days. 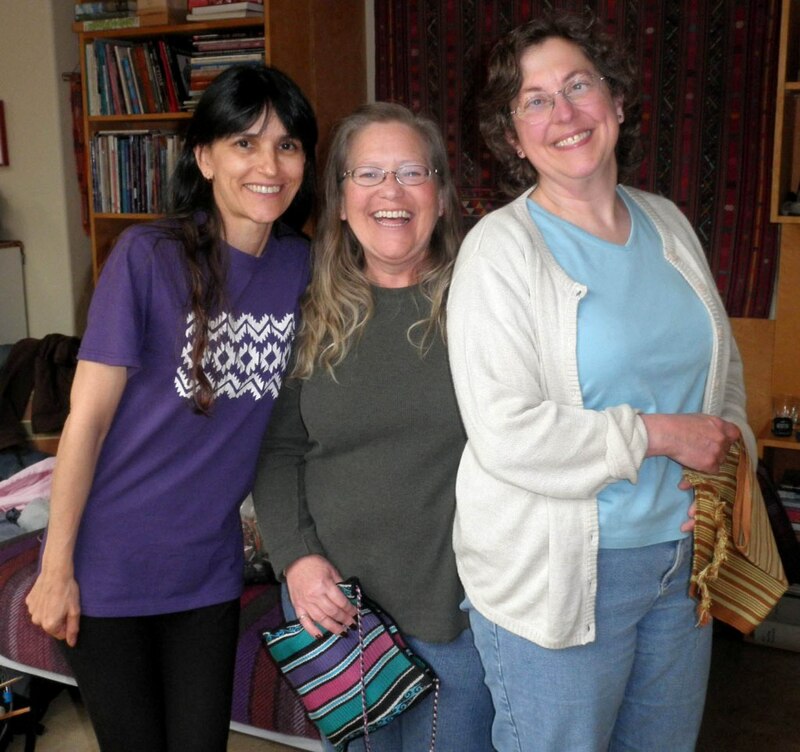 They brought a few of their backstrap woven pieces to show and we marveled at how far they have come since joining the group and that very first weave-along we did in January last year. We wove patterned tubular bands on Tuesday and I know that they have been hard at it at home since then. Bobbie also brought along the beautiful wide Guatemalan piece with its super fine cotton yarn on which she has been working. On the left is Bobbie’s Bedouin-style runner with al’ouerjan patterning. I think she may have warped this when we had an al’ouerjan warp-along weekend. Next to that is her plain-weave striped piece that I am guessing was part of the plain-weave weave-along we did in the fall of last year. She added some weft twining to that. Jennifer’s backstrap is a gorgeous combination of stripes and colors which was also influenced by Bedouin textiles that we have been looking at in the group. I am pretty sure that this also formed part of the plain-weave weave-along. Trouble decided to nap on Bobbie’s pebble weave bag. This is the piece she made as part of the very first pebble weave weave-along in January last year. 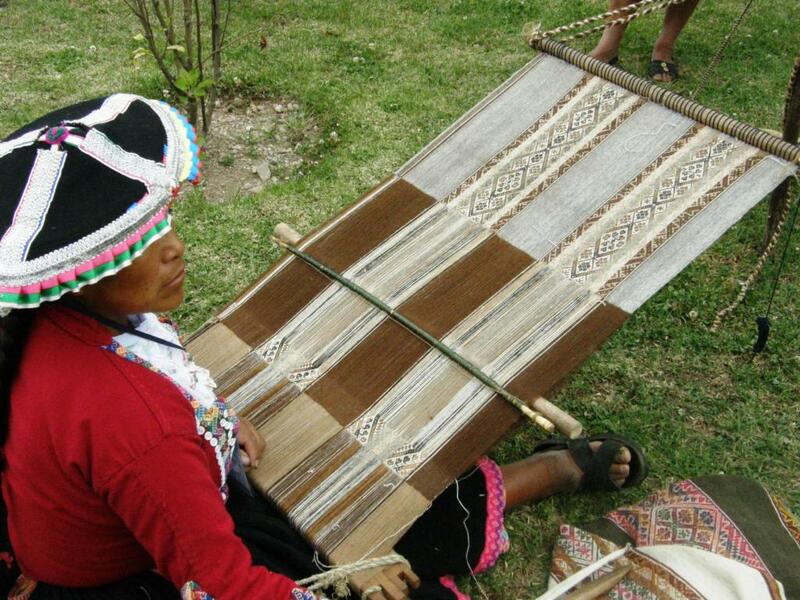 At left you can see her rolled up Guatemalan warp and here she is working on it…. She has a long tale of mishaps to tell of when she was trying to put this warp together but you would never know by looking at it now! She is doing a simple warp pattern which Jennifer showed us in the Ravelry group. She had seen and admired it on the Education and More website. It caught Bobbie’s eye and she asked for suggestions for how to set it up. As the same warps are always floated, she has them permanently stored on a pattern stick. Looking at the sticks in the above picture from bottom to top you see the stick that holds the second cross, the pattern stick, the shed rod, the heddle rod and then the sword. 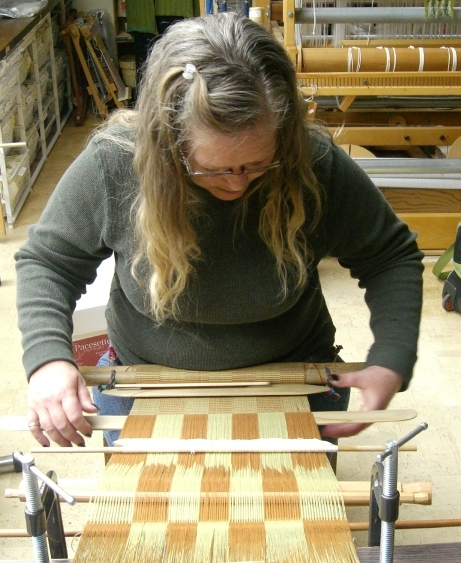 Certain warps from the shed-rod shed are floated with the warps from the heddle shed. You can see the warps sitting on top of the pattern stick below. Isn’t that a great looking warp?! Bobbie bought this naturally dyed cotton warp yarn from the Education and More site. Beware! It is very fine stuff. Bobbie shared some with Jennifer who has started a plain-weave piece with it and I believe that some has also gone off to Popsicletote (another Ravelry group member) and maybe we will see a project from her soon. And just a few days after we all met up, Bobbie announced on Ravelry that she had finished her piece. Woo hoo! Look at that! She posed a couple of her tubular band practice pieces on top of the finished piece. Jennifer came alone the following day and we sorted out some questions she had on complementary-warp weaves. These guys have learned so much from just using my online tutorials and books but it is a real help to be able to see things being done in person and ask some more specific questions. It was good going over four-stake warping with them. And it was great just talking!! On Friday I had a fun day with Emi. Emi joined in with all the weaving groups. “Well, this is strange….just when I was getting my wee cat head around all this stick-and-string business, this gal comes along and throws her toes into the mix up.” (Of course this way of tensioning the warp is used in many South-East Asian weaving cultures but most often when using a circular warp). 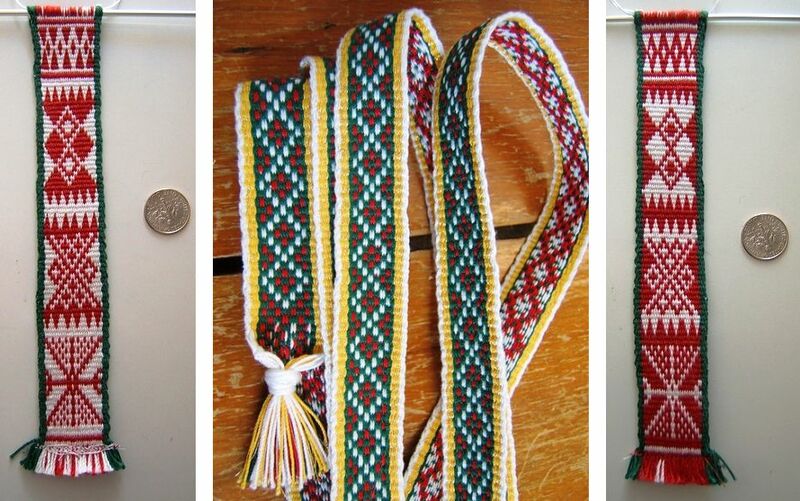 We wove two-color simple alternating floats weaving designs like those I have copied from Krygyz yurt bands. Emi worked on trying to read the pattern directly from my woven belt rather than from a chart and she did a good job! Later on we did some braiding. And finally, she went home having gotten some practice with handling a wide warp with fine threads. She wove quite a bit on my sample warp learning to operate the sheds smoothly and handle the fine yarn. I think that the two major obstacles that backstrap weavers in my online groups have are fear of finer yarns and wider warps. I am hoping that Emi will be able to pass that obstacle having had this experience with the wider warp. Here she is using a nice technique to gently and cleanly open the heddle shed. Before going home she treated me with a lesson in something from her Japanese heritage. I got a demonstration of the tying of the traditional furoshiki cloth and an explanation of what this cloth, and its use in wrapping items, means in Japanese culture. She showed me one of the wrapping styles and then demonstrated how a Japanese person would present the wrapped goods to another person…beautiful! And then she showed me how the same piece of cloth with a few clever twists and folds can be transformed into a shoulder bag. Isn’t this the coolest thing! 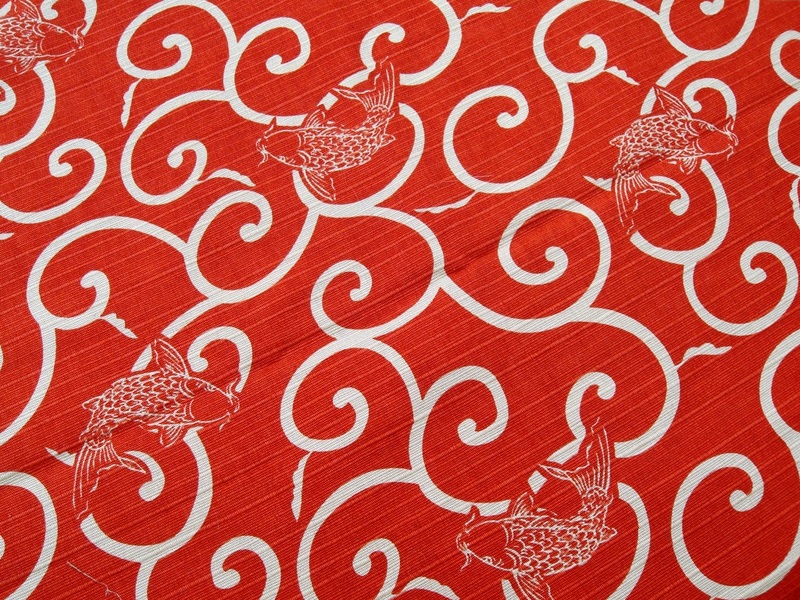 And just when I was thinking of the best way to weave a special wrapping cloth for myself, Emi showed up to the next weaving group and gave me my very own furoshiki cloth! The one on the left is the piece that Emi gave me and Betty showed me one that a friend of hers in Japan had given her. I think we all need to have a furoshiki! I am sure that if I Google this I will find a book on 101 ways to fold and tie a furoshiki! 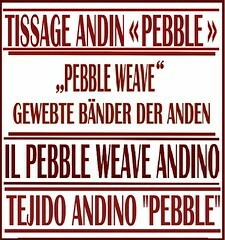 And then it was on to the pebble weave. We had a beautiful sunny day once again with light streaming through the skylights and all of us wishing we were wearing shorts by mid afternoon. Most of the first group returned and we also had Anita join us. 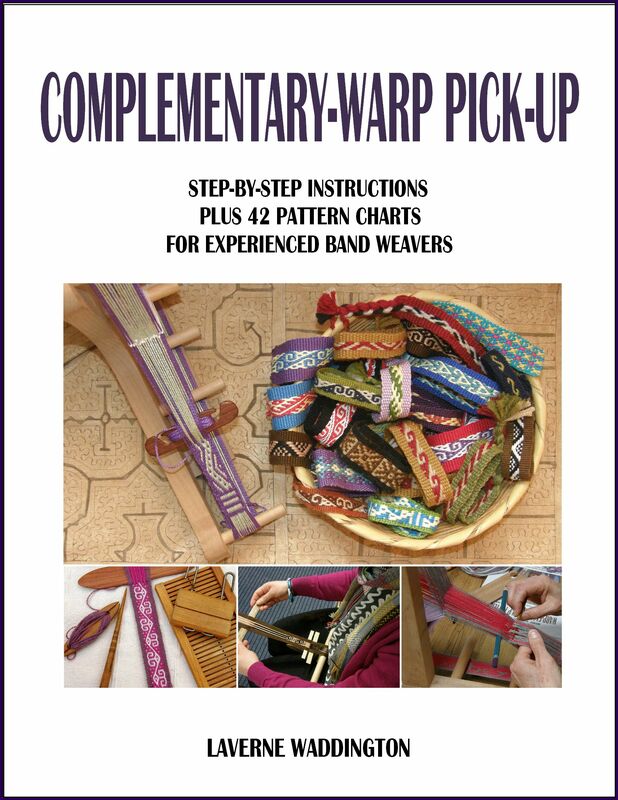 We dove right into two-heddle pebble weave and had two days of fun. That’s Jenny, Sharon and Anita with Linda on the right. Linda took a break from weaving to try drawing designs onto charting paper directly from the sample textiles I had on hand. 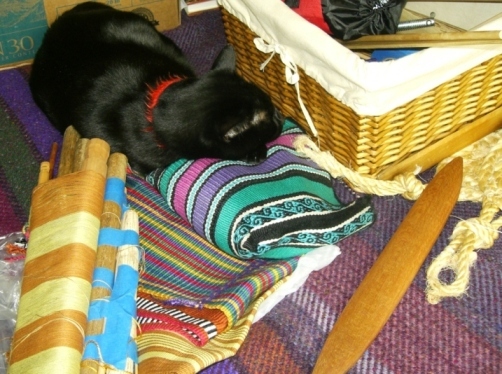 Emi settled into her warp on the floor and even Betty threw on a backstrap and wove. Sasha, who wove super fast and found herself ahead of the rest of the group, decided to remake the heddles on her large warp. There is, of course, a story behind that warp which I will tell in a future blog post. She has promised me some pictures in the meantime to make the story more even more interesting. And there were other gifts! Sarah, pictured above, gave me an example of her weaving in a lovely lined pouch made with fabric that she wove with sixteen shafts. Anita brought me a fabulous sword/beater cut from South American marblewood…so smooth and glossy, it feels wonderful in my hands. Last night Betty and I were invited for dinner at Carol and Jim’s home. We listened to their exciting travel stories and saw pieces created by Carol using her handspun yarn…all kinds of fiber from rabbit to camel. Carol and Jim have traveled the Silk Road from China through Uzbekistan and Kyrgyzstan…imagine how my ears pricked up at those names! I was even wearing the belt I wove based on the Kyrgyz yurt band. I got to see a fabulous felt piece that they bought there that has been edged with a band in the two-color simple warp float technique. I try hard to keep up with happenings on the Ravelry group while I am on the road and there has been a bit of activity lately to report. Jentide has been weaving bands with Bedouin designs. 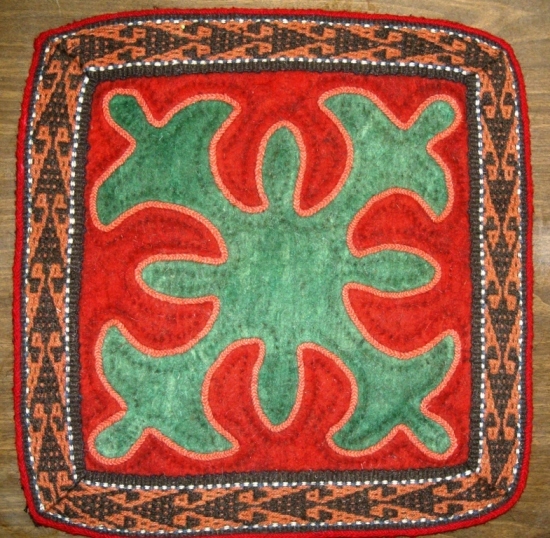 She wove the shajarah motifs in double weave rather than in the traditional warp substitution technique. Double weave creates a double faced band rather than one with long floats on the back which the latter method produces. She also wove a band with al’ouerjan patterning. While snooping around her project page I found her double weave key fob woven on a backstrap loom using the sweet Bolivian flower motif that I have charted here in the tutorials. The small band was woven on her backstrap loom and the longer one on an inkle loom. 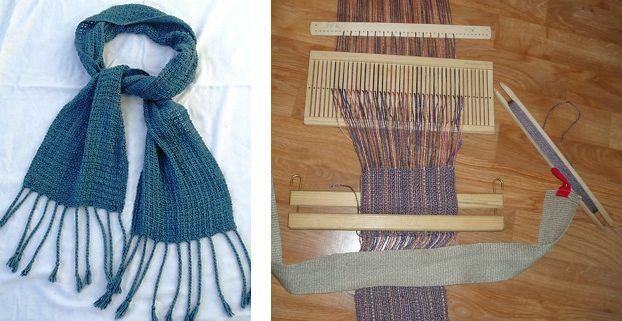 Heidai continues to weave pretty scarves on her Scandinavian-style backstrap loom with its rigid heddle. 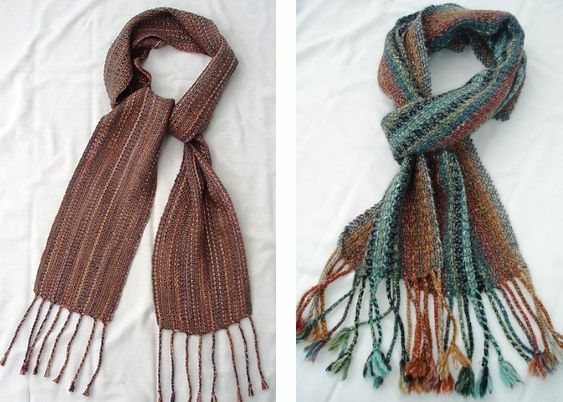 On the left is her scarf in alpaca and silk and on the right in noro silk garden. 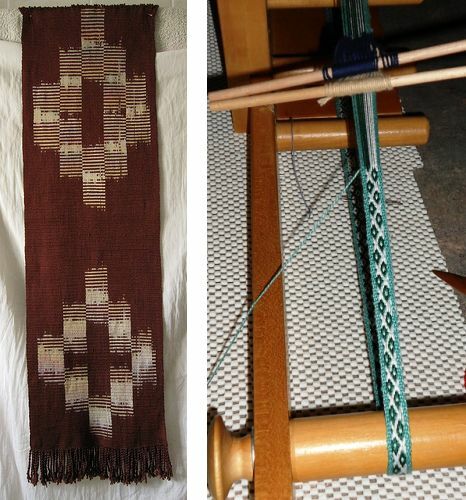 Here’s one more in silk along with the backstrap loom set-up that she has been using…so simple! A backstrap by backstrap…also by jentide. Tracy finished her backstrap woven ikat piece for our current weave-along and Alison has just started out using my book for pebble weave and has made her first band on a loom on which she feels more comfortable…the inkle. 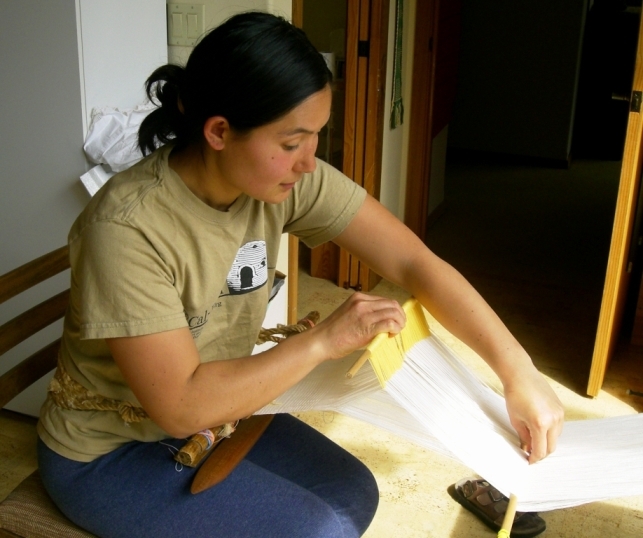 She followed the instructions for setting up the warp and is using her inkle loom to tension it. 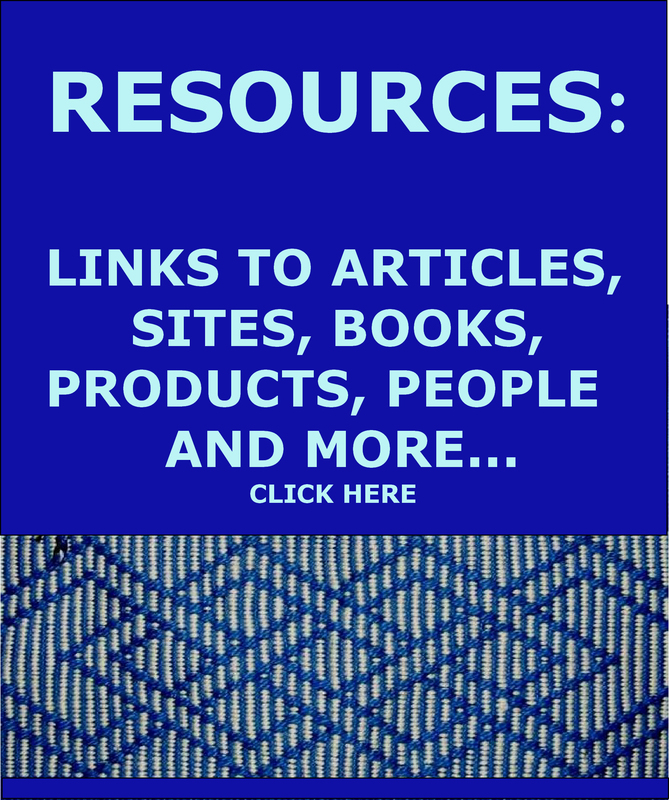 I have had a couple of days free to blog, catch up on mail, and then I will be meeting with a basketry group on Thursday. I am looking forward to seeing their baskets. We have a small group of talented basket makers in the backstrap group too. I am not one of them! I will see you soon with more backstrap weaving. Thank you Yonat. It really has been exciting connecting with the Ravelry guys and having such a variety of weavers to play with. What a wonderful trip, all that snow and all those incredible woven pieces! A feast for the senses! 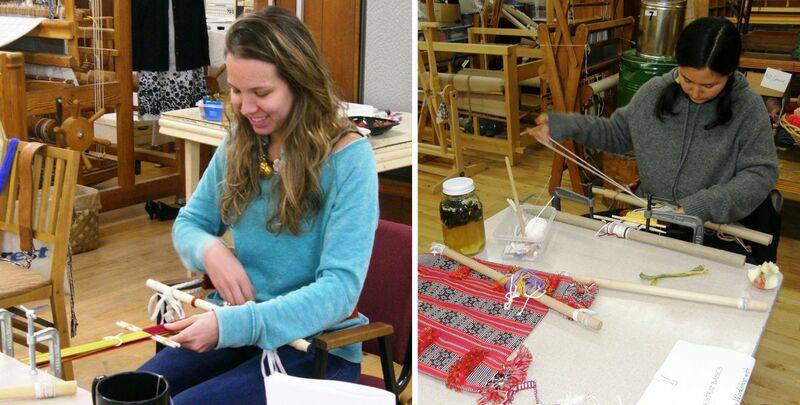 Your weaving friends are all producing lovely work! I hope the back-up camera holds out. Safe travels! Thanks Caroline. The back-up camera is holding out…much better now that I have upgraded from a 32 MB memory card to a 2GB one…imagine! but the 3x zoom is a bummer. I have plans for a new camera in the works. Thanks for all the inspiration here, I really wish I could weave with you some day. Beautiful train photos! Sorry about your camera. The weaving pictures are still wonderful! 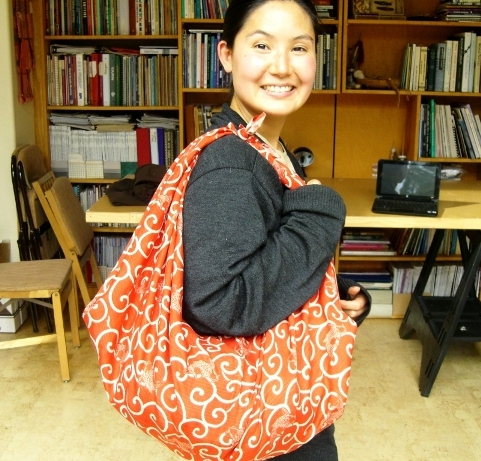 Will you teach me how to tie the fabric into a shoulder bag? That’s marvelous. Thanks Claudia. I have found an exciting solution to my camera woes which I will tell you about soon. I will have to have Emi teach me again about how to tie the fabric…I was just watching the result rather than the process. I will see her again on Thursday. Maybe I should take a video! Another beautiful blog post. Laverne, I’m sorry I could not fit in a visit with you. I’m busy at work, and with a couple of volunteer endeavors. Fortunately I will be able to meet up with Jennifer and Bobbie at Black Sheep Gathering in June. Since I have more help with my booth this year, we will be able to have a proper meet-up with some real weaving. I’m thinking about meeting in the Sheep barn so we can spin and weave with wool right next to the flock who provided the wool. 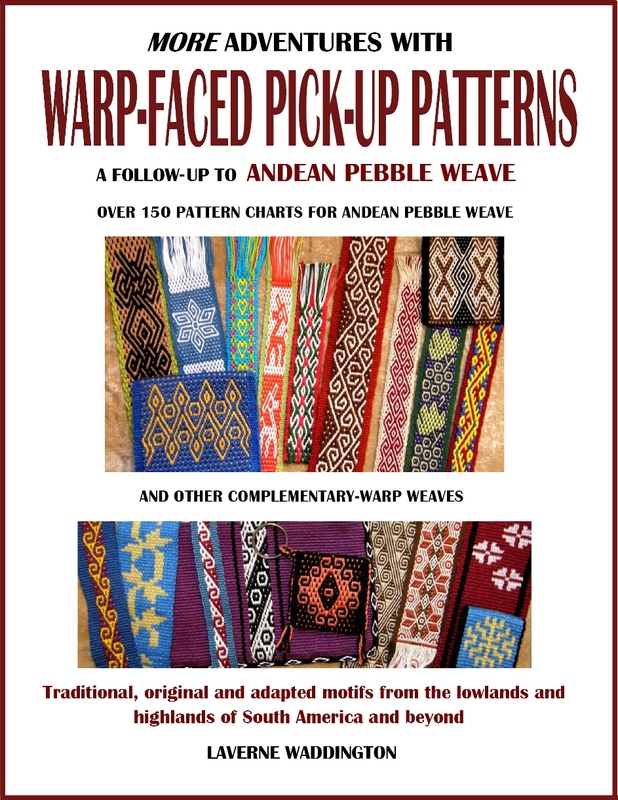 Thanks for showing us all these beautiful weavings and weavers. We missed having you, Janet! I am hoping to make it to Black Sheep NEXT year and we can all have a big meet-up. You, Bobbie and Jennifer will have a ball I am sure this year! I love the way that you live in a world so full of interesting textiles! 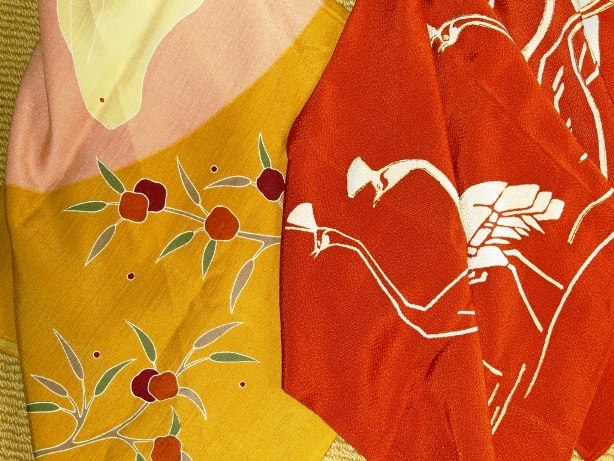 the Japanese wrapping cloth is such a simple idea, but so clever and fascinating. Sorry about your camera. 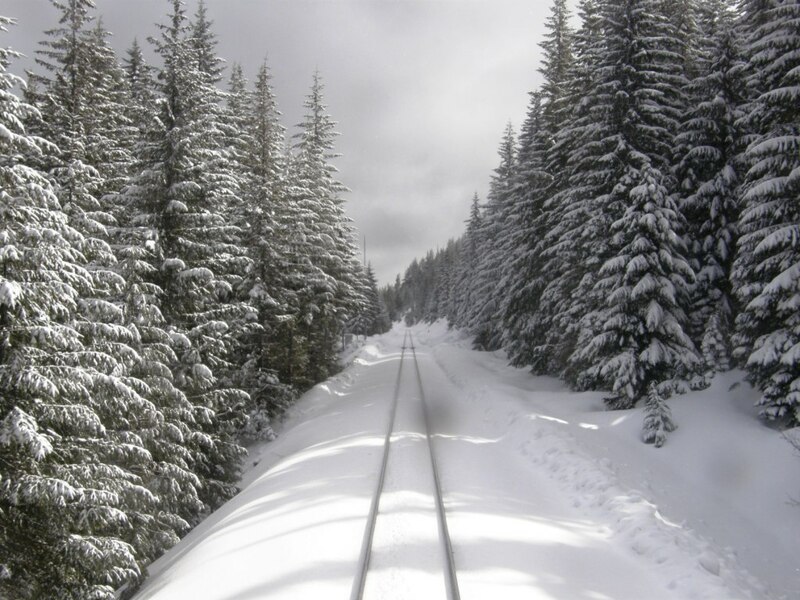 The snowy photos from the train are fabulous. Remember just a few weeks ago you were so hot and muggy fighting off mosquitoes at home? Oh yes, those pesky mosquitoes…and here I am sipping hot chocolate with Irish cream in front of a fire! I just discovered your blog. Thanks for all the resources, some really beautiful items. Have you ever worked directly with an accessories designer, or is this something you would be interested in? Hi Tamara. Where do you live? Thanks for the comment. I have not considered working with a designer…not really my thing…but, some day who knows? Laverne, Love your post! 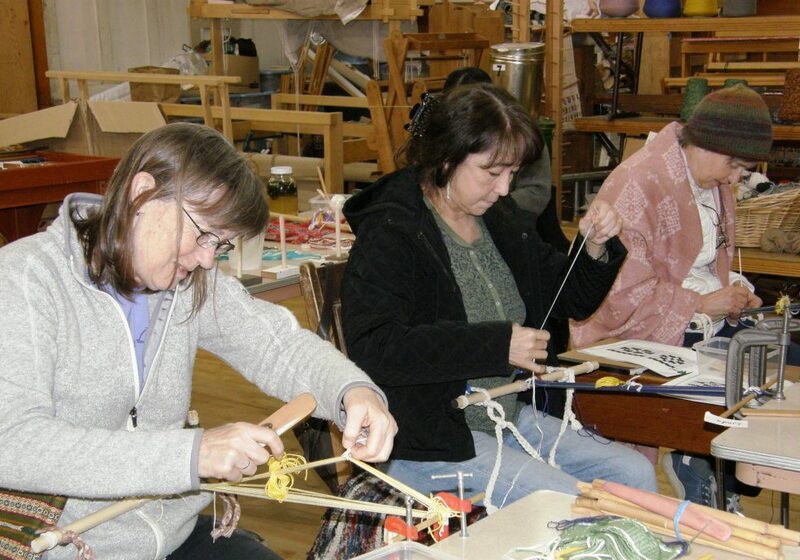 So wonderful to see your weaving friends in action and see some of the faces from the group! Ah! that I would have time someday to weave with you! I am in Guatemala now but haven’t had time to do any weaving — just never enough hours in the day but finally having a little time to catch up with the Ravelry group and your blog! Thanks again!